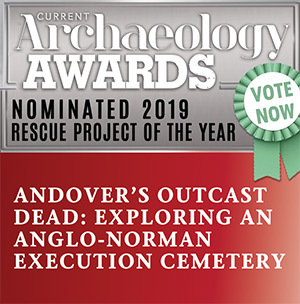 The 2019 Current Archaeology Award nominations have been announced, and we are excited to share with you that our investigations on Weyhill Road, Andover, have been nominated for Rescue Project of the Year! Projects nominated for this award are those where the archaeology was threatened by human or natural agencies. In this instance, a brownfield site was chosen as the planned location of a new Aldi store on the western edge of Andover. Supported and funded by Aldi, we began working on site in 2016 with a watching brief which later developed into an excavation due to the discovery of the remains of cemetery containing the graves of at least 124 people. Analysis of these individuals has indicated that the majority were those of younger males, and many of the bodies and their burial rites (including decapitation, bound hands, being laid in the grave face down etc.) suggest that they died subject to punishment under a legal system. A few examples of this sort of special ‘punishment cemetery’ have been found before from late Anglo-Saxon times with occasional hints that they may have continued after the Norman Conquest. 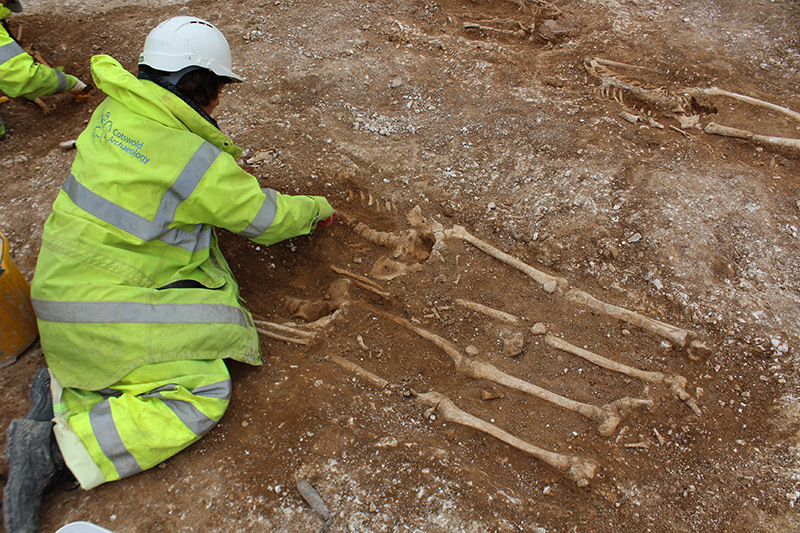 Our radiocarbon dates have shown that this happened at Weyhill. It has previously been thought that in the medieval period most criminals would have been buried in normal cemeteries, but our dates provide by far the most comprehensive evidence yet that in some places at least punishment cemeteries continued in use well into the medieval period. This makes the site rare and of national significance. All nominations for the Current Archaeology Awards are based on articles and books featured within Current Archaeology over the last 12 months. We are grateful for the nomination and for the recognition that this project has received. It is a great investigation to be part of, and we have enjoyed every minute so far. We hope you do too! Voting for the awards is live (until 11th February 2019) and is open to everyone. We, and the project, would be very grateful for your vote!